Tonight gallery nine5 is proud to present, for the first time in a gallery setting, a series of truly original works by lighting master and artist, Bentley Meeker. Flame to Now,featured on three walls of the gallery,explores the transformative power of light and its effect on our emotions. The titles of the installations echo the progression of man’s use of illumination from fire to the electric light. 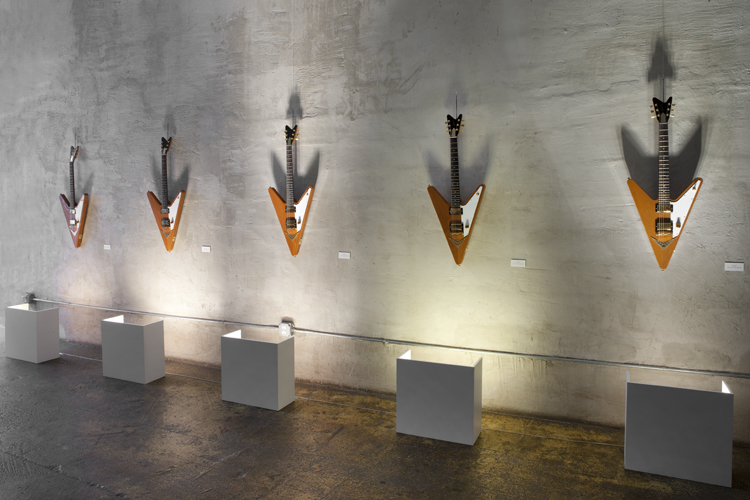 The show features three objects that are displayed quite simply and democratically, except that they are lit by different sources. Meeker chose roses, ropes, and guitars to spotlight his work due to their recognizable and relatable nature. The pieces are designed to give viewers an awareness of the five different light sources that are utilized most often in the spectrum of electric light: Edison tungsten (facsimile of), incandescent, halogen, fluorescent, and LED light, which are displayed from left to right in this order. Each object looks similar to one another but as the viewer experiences each piece, they become increasingly aware of the quality of light on each object and, by extension, the role that light plays in our lives. Meeker hopes to underscore his opinion that all light is not created equal. Lighting plays a greater role in our emotional response to the world than we often realize. Following the exhibition of his work at gallery nine5, Meeker will be showing at the Whitney Museum. Bentley Meeker grew up between North America, the Bahamas, and Canada, and has resided in New York City since the age of 14. The artist is the owner, and president, of Bentley Meeker Lighting and Staging, Inc., one of the leading lighting firms in the world today.